The 70 arrived a year after the 50 and 60, with many of the same features. Later it earned two distinctions all its own, and shared others with its year-old brothers. Originally available with gasoline, “all fuel”, or LP-gas engine, it later offered a diesel option. The 70 thus became the first John Deere diesel row-crop tractor. In its Nebraska test, the 70 Diesel set a new fuel economy record, bettering all previously tested row-crop tractors. 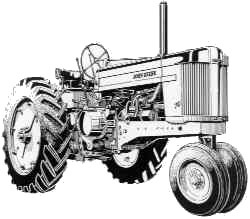 In 1954, the 50, 60, and 70 became the first row-crop tractors equipped with optional factory-installed power steering. John Deere engineers achieved this industry first with a system that used built-in hydraulics to control the steering column. This differed from “add-on” systems utilizing externally mounted motors on steering shafts or hydraulic cylinders hooked up to tie rods. Improvements in equipment control paralleled improvements in tractor power and performance. Case in point: The 801 Hitch, an early weight-transfer hitch that transformed implement draft resistance into downward pressure on tractor drive wheels. It was introduced on 50, 60, and 70 Tractors. In addition to the row-crop model, the 70 was available as a somewhat unusual standard tractor. More accurately, it was a wheatland tractor built on a row-crop chassis. Fenders and front axle were all that distinguished it from the row-crop model. The 70 was originally rated at 34.25 drawbar hp and 43.77 belt hp.